Alabama dominated Florida 54–16 in the SEC Championship game Saturday to extend its winning streak to 25 as it prepares for the College Football Playoff. In at least one very important respect, Saban was probably wrong. Alabama could have lost to Florida in the league title bout without imperiling its placement in the playoff field. Maybe a defeat would have affected the Crimson Tide’s seeding, knocking them from the geographically-preferable Peach Bowl (Atlanta) to the Fiesta Bowl (Glendale). Maybe not. Either way, the Crimson Tide have been a virtual shoo-in for the national semifinals since clinching the SEC West in the middle of November, when division rival Auburn lost to Georgia. But Saban wasn’t talking about the playoff. His statement concerned the standard to which he holds his team. His feelings probably accord with anyone who has watched Alabama this season. The Crimson Tide are the best team in the country, and the expectation is that they will win every time they take the field. So it was again on Saturday, as Alabama downed Florida 54–16 in the Georgia Dome to extend its winning streak to 25 and keep alive the possibility of the program completing its first undefeated season since 2009. The victory assures the Crimson Tide will have a drama-free selection Sunday. The committee has every reason to assign Alabama the No. 1 seed in the CFP. There was a short stretch early in Saturday’s game where that didn’t feel like a foregone conclusion. On its first drive, Florida marched 64 yards to take a 7–0 lead on a five-yard touchdown pass to Antonio Callaway, marking the first time Alabama had surrendered a touchdown since Oct. 22 against Texas A&M. 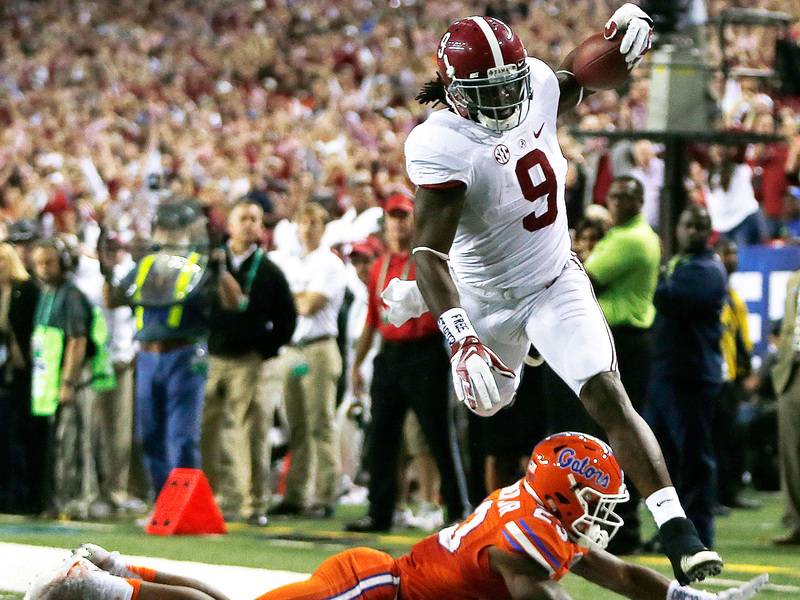 The Crimson Tide responded with a punt, giving the Gators possession with a chance to extend their lead. It quickly became clear, however, that Florida’s early surge wouldn’t sustain. A Shaun Dion Hamilton interception led to a field goal, Minkah Fitzpatrick ran back another pick less than three minutes later to make it 10–7 and Joshua Jacobs returned a blocked punt for a touchdown near the end of the quarter to put the Crimson Tide up 16–9 (the PAT was blocked and returned for two points). With those three plays, Alabama had taken control of the game even though they’d recorded -7 yards of offense at that point, and all the optimism stemming from the Gators’ rousing start had evaporated. Alabama’s offense eventually got going, starting with a six-yard touchdown pass to graduate transfer wide receiver Gehrig Dieter in the second quarter and continuing with a rushing score from Jacobs with less than four minutes before the half to expand the Crimson Tide’s lead to 33–9. But those points were window dressing: Alabama had already displayed its superiority over yet another quality opponent despite going backwards with the ball in its possession. The Crimson Tide spent the most of the second half in cruise control. The result confirms what we already knew to be true about Alabama: It's really good, and it’s probably not going to lose this season unless it beats itself. The putrid offensive start the Crimson Tide had against the Gators would qualify as self-sabotage, but coach Jim McElwain’s team, which entered Saturday ranked 98th nationally in Football Outsiders’ offensive S&P + rankings, wasn’t equipped to take advantage. Maybe they won't be quite as fortunate against their playoff opponent. Who will that be? It’s too soon to say. No. 4 Washington, which crushed Colorado in the Pac-12 championship game last night, is a good bet. But it’s possible the committee could deny the Huskies a bid in favor of the Big Ten champion, either No. 6 Wisconsin or No. 7 Penn State (the two teams play Saturday night at Lucas Oil Stadium), or another team from that conference, No. 5 Michigan. Alabama would be a heavy favorite over any of those squads. But in case there is any confusion about the playoff: No, it would not be O.K. for the Crimson Tide to lose.